Welcome to Southern New Zealand, home to awe-inspiring locations, world-class crew and equipment, and film-friendly communities. We are the third largest production centre in New Zealand, surrounded by a largely unspoiled landscape. A key strength of our region is opposite seasons to the Northern hemisphere—snow in July and sunflowers in February for that vital scheduling edge. Recent features, including MISSION: IMPOSSIBLE - FALLOUT, A WRINKLE IN TIME, ALIEN - COVENANT and PETE’S DRAGON, continue to build on the legacy of the legendary HOBBIT and LORD OF THE RINGS trilogies. Brands such as Samsung, Subaru, Yamaha, Audi, Corona Beer, Red Bull and many more nurture our international TVC market. Our resident crew base is uniquely placed to service all of your production needs, ensuring you get what you need, where you need it and when you need it, even in rugged remote locations. As the regional film office, Film Otago Southland is here to smooth the road to your next production in New Zealand's filmmaking heartland. Get in touch today to find out how we can help. 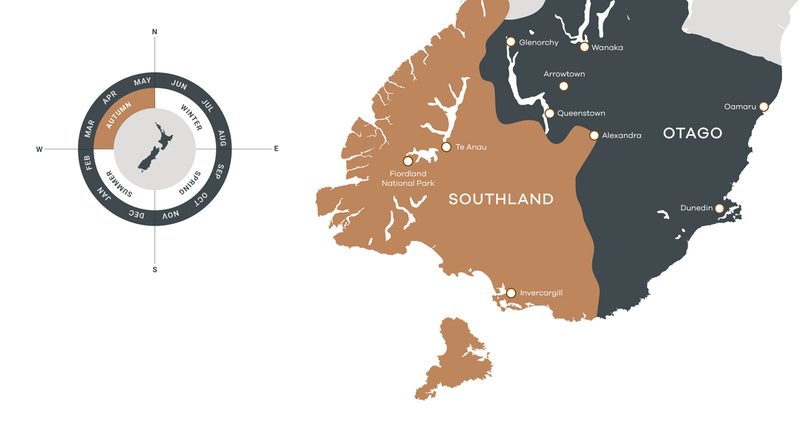 From national parks to period townscapes, Southland delivers accessible diversity. The World Heritage Area of Fiordland presents a landscape of ancient rainforests and granite peaks. Its capital Invercargill offers period backdrops and screen know-how from the Sir Anthony Hopkins School of Dramatic Arts. The inland area of Central Otago is home to rugged vistas and charming townships. It offers a unique landscape of tussocky fields against a backdrop of snowy mountains. The region also has a rich 'Gold Rush' heritage, which has been retained in old-world towns like Cromwell and Clyde. Queenstown has been an established screen production centre for over forty years, with high-calibre crew, world-class equipment and an international airport at its doorstep. The region is also favoured by filmmakers for its mountains, lakes, forests and farmland. Waitaki offers 150km of beautiful coastline, unique geological attractions, valleys and farmland. A regular starring location is the town of Oamaru, which is known for its Victorian Whitestone district and Steampunk culture. Dunedin is a film-friendly city with breathtaking scenery and distinctive, old-world charm. A location for several high profile features, filmmakers come for unique wildlife, coastal and inland scenery, and the widest selection of Victorian buildings in NZ. Rural meets coastal in the diverse region of Clutha. The area is home to the famous seascapes of The Catlins, as well as miles of unspoiled winding coastal roads. The region also offers rural backdrops and leafy forests.